Those are the words Stanford envisions on his tombstone (page 4). He's just gotten an F on his final book report in Mr. Glick's English class and now he has to go to summer school instead of basketball camp. And if he doesn't pass the class, he'll fail the sixth grade and worse! He'll be kicked off the A-team, the best basketball team in the school. The basketball team that a sixth grader has never made before. Not only does Stanford have to endure summer school, but his parents have hired the annoying, geeky genius Millicent Min to tutor him. Stanford's grandmother is moving out of their house and into a retirement community (a change she's NOT happy about). And Stanford's dad is working so much he's hardly ever around. When he is around, he's just yelling at Stanford about his grades. Stanford doesn't want to tell his friends (teammates on his park district basketball team The Roadrunners) that he flunked English, so he makes up a story about having a summer job. And when the sweet and pretty Emily Ebers starts showing up with Millicent, Stanford worries that she won't like him if she knows he's stupid, so he tells Emily that he's the one tutoring Millie. And after that, well, things just get way out of control. 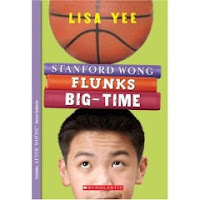 Stanford Wong Flunks Big Time is a great, great book to pick up for your summer reading pleasure. Once I got into Stanford's story, I couldn't put it down. It was great to see him grow and change and to see the changes that happen to all of his friends, too. A lot can happen in one summer. The story's told in a diary-like format that really kept me turning the pages. I think the neatest thing about this book is that it's a sequel to Lisa Yee's Millicent Min, Girl Genius. It tells the same story, but from the perspective of Millicent's arch nemesis Stanford. You don't have to read Millicent Min first, so if you enjoy Stanford's story, pick up Lisa Yee's other books to see other characters' points of view. I've really enjoyed Millicent's and Stanford's stories and I'm looking forward to reading Emily's in So Totally Emily Ebers! Be sure and check out Lisa Yee's blog and visit her over at Fusion Stories.